I was arranging the books I picked up yesterday on the little table next to my bed when I realized that I had a relatively formidable stack of books I've been meaning to read. Is your stack diminishing or is it growing? Does having a list of books waiting to be read serve as a comfort or as a source of frustration? Here's the pillar of books that I absolutely must read within the foreseeable future. Re: How tall is your stack of "TO READ" books? To answer those questions of urs jem... im here! Yes, i have piles and piles of to be reads! so jem, its really fun to have a lot of tbr's but at the same time it got me confused as ever. sometimes, i just do random choosing just to be fair and equal. Woohoo! Thank you for your answers, miss Arjaye. The pile pictured above is also just one of many that I have. That's just the one next to my bed. I like that I have books to look forward to as well. 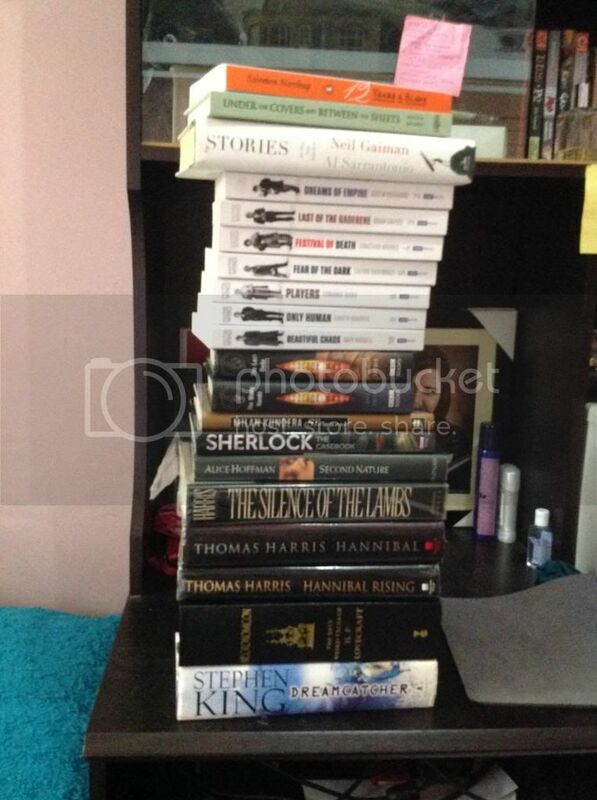 But somehow, I keep on getting side-tracked by work and other books which causes my stack to just grow some more! That's an interesting stack, Jem-san. The Curious incident of the dog in the night time and Miss Peregrine's home for peculiar children are good short reads. I have piles on piles of unread books as well. I'm really impulsive when it comes to buying books, last year my to read list had finally caught up to my read list. We're actually moving so I don't have all my books on hand, but there's a stack that I didn't box up in case I ever find myself itching for a read. That's a mighty stack of books, koori-chan. I still have books in bins that I have yet to read. The ones in the photo are just the ones I acquired this year. haha I used to read a bunch of books in the same period but I, thankfully, broke out of that habit. not good for my aging brain, you see. Sounds like you're gearing up for the reading Olympics, miss laila. I've had a list of books to read but I've never had a deadline. Gold medalist na kayo, I'm sure. Take it easy though. Wouldn't do good if your eyes did pop out of their sockets from over reading. i have 25 books to read and another 20 Ebooks . Is hoarding books bad ? i keep on telling myself not to visit Booksale until i finish all my books but when stress from work gets into me, BOOKS are my therapy. so there, i have all those books waving at me saying "read me" everytime i open my cabinet. @jem ....i can't help it..it's like my internal body clock is telling me you are way past your max time limit of not having read a book. i tried to just relax and slow down with my pacing. but looking at my TBR list and the sequels are coming out this year i get agitated O_o hay naku! my reading challenge this year is 150 books. that is actually 100 less compared to last year. but since i don't want to go through that insanity or else duguan na yung mga mata ko...LOL! 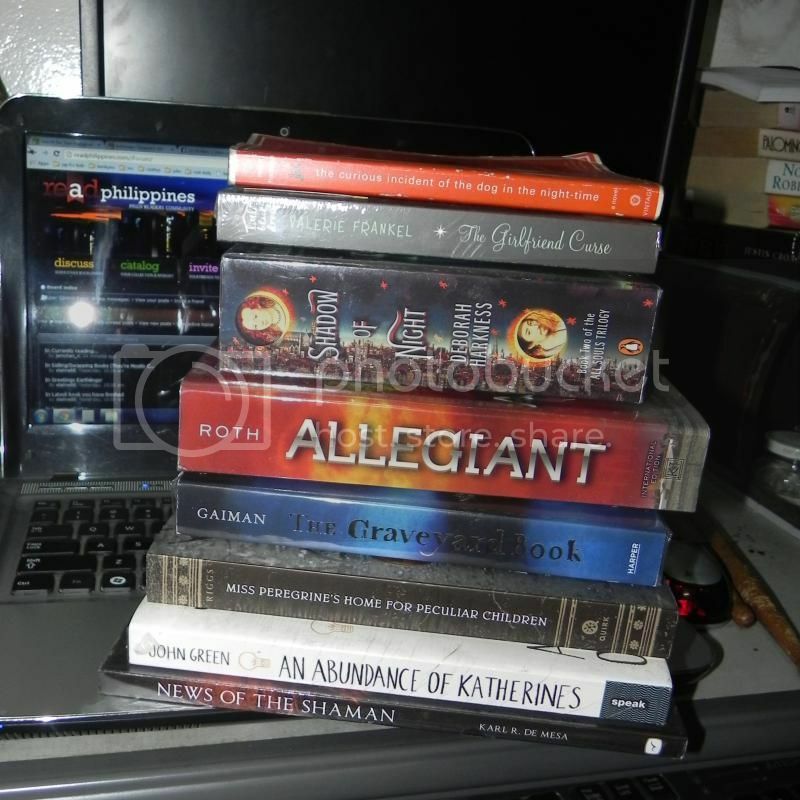 For now i am busy with my Divergent fandom! malapit na yung anticipated movie ko! it is going to be exciting talaga! @joesel...hoarding books is never bad...hehehe! Usapang busy. hahaha. I think I have 8 at home,yung last kong bili sa booksale. Sinadya kong hindi dalhin sa boarding house dahil maraming trabaho ang teacher kapag end ng school year so, baka sa April ko na mahawakan ang tbr ko. Mabuti na lang, fast reader ako. hehe..